Spread the dough on a floured surface. Transfer to a pie mold (9-in diameter). Heat the oil in a large pot over medium-low heat. Add the onion and cook for about 3 minutes. Add in kale and cook until soft, for about 2 minutes. Fold in chicken and corn. Mix until well combined. Set aside. Beat the eggs and milk in a large bowl. Pour over the kale and season with salt and pepper to taste. Put the mixture over the dough and top with Parmesan cheese. Bake until the filling hardens in the middle, for about 30 minutes. You can replace kale with spinach or chard for a different touch of flavor. 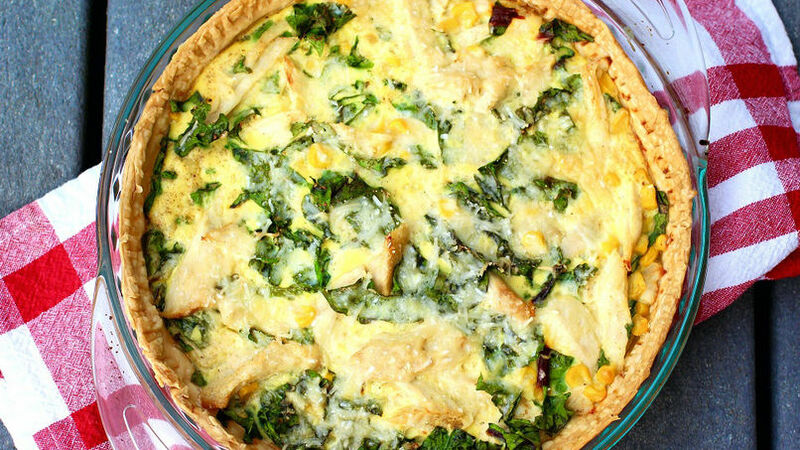 This chicken and kale tart is very versatile: you can serve it either for breakfast or lunch. You can even add other veggies you like or that are in season. Salty tarts are the perfect dishes to include green vegetables, especially when it's hard for us to include them in our family diet. They also go great with all kinds of ingredients and you can even reuse your chicken or meat leftovers by adding them in!